Good looks, turbocharged power, low weight, excellent handling, and a distinct sound, Mazda’s FD RX-7 of the 1990s had it all. The car’s unique power plant and timeless looks turned it into an iconic representation of the rise of import performance, making it a highly sought after platform among all of the automotive community. 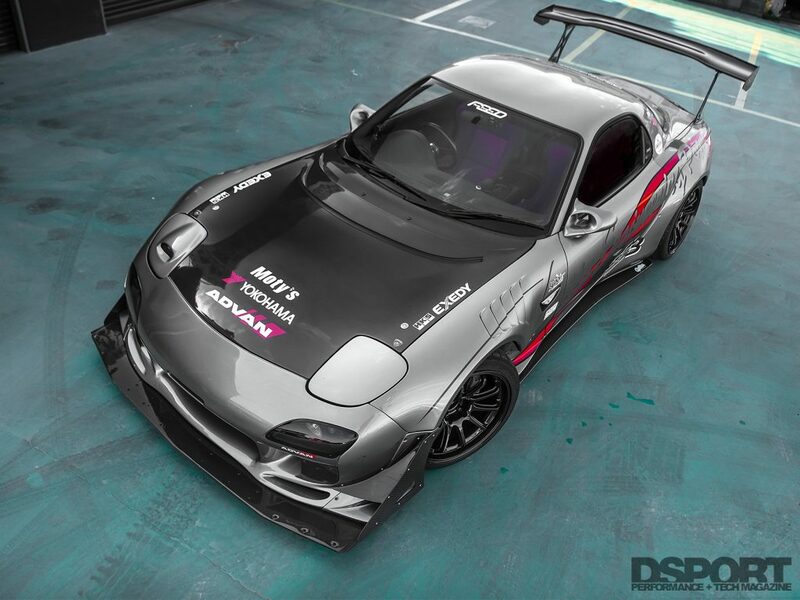 Fujita Yoshiharu and his Fujita Engineering FEED Racing Program team have long appreciated the importance and performance potential of the FD platform, so they decided to search for an example to call their own. This build would turn into the team’s testing platform for new engineering concepts and performance hardware to offer to customers. The RX-7 still stands as one of Mazda’s boldest efforts as the car that did away with the standard piston engine used everywhere else. The rotary, or Wankel, motor filled the engine bays of the R-series Mazda from the early 1970s up to the RX-8 which closed out the rotary engine era for Mazda only a few years ago. 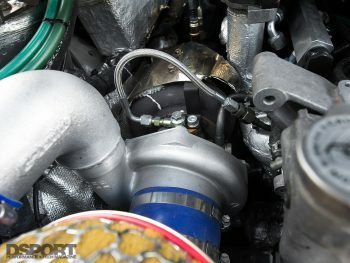 You’ve likely heard the complaints surrounding the engine when it comes to burning oil, frying apex seals, and 20,000-mile engine rebuilds that plagued many of the RX-8s. The rotary engine can indeed be finicky, but many forget the benefits that come with it. This type of engine is simple in its operation, with very few moving parts and a very high power-to-weight ratio since it weighs under 250 pounds. The design of the triangular rotors and oblong housing are setup to deliver three combustion pulses per revolution, as opposed to the one per revolution of a two-stroke and the two per revolution of a four-stroke. This results in a smooth power delivery that loves to wind up the RPMs well past most piston engines. As Mazda’s efforts in racing with the rotary power plant proved successful with the 787 in 1991, the only Japanese entry to win the 24 Hours of Le Mans to date, the RX-7 became all the more attractive. 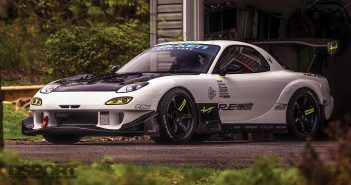 The timing was then right for the debut of the next generation FD RX-7 with a redesigned chassis and a sequential twin turbocharger to boost the two-rotor 13B. Since then, the FD generation stands as the most popularly desired model of Mazda’s rotary-powered lineup. 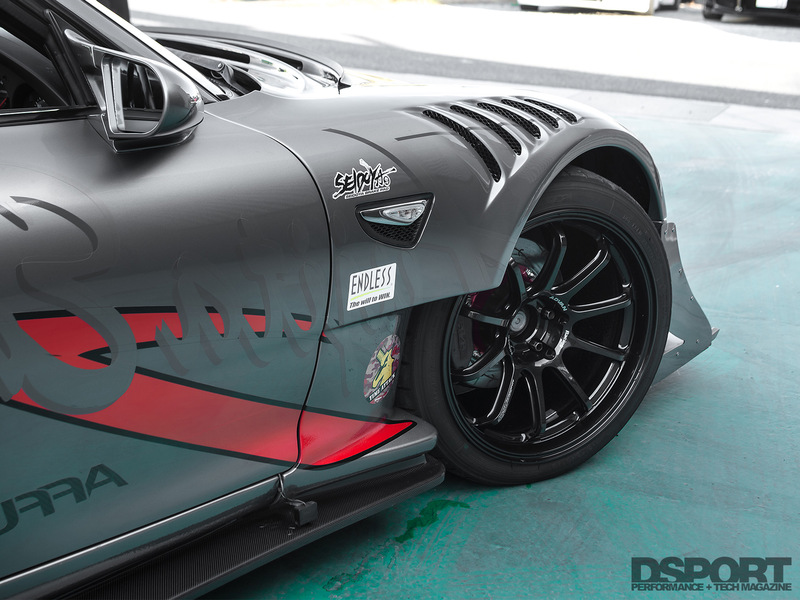 In 2007, Yoshiharu shopped for a worthy FD foundation to build upon as the company’s poster development vehicle. 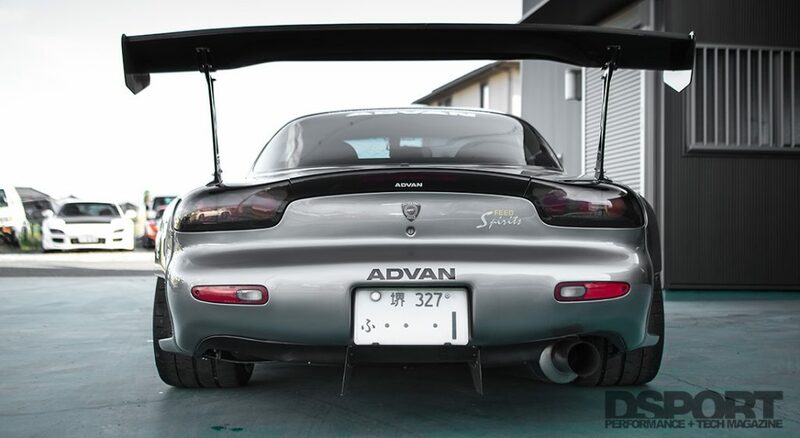 The search was over when he came across the 1997 Mazda RX-7 FD3S that they are still building today. At the start of the build, the goals were simple. 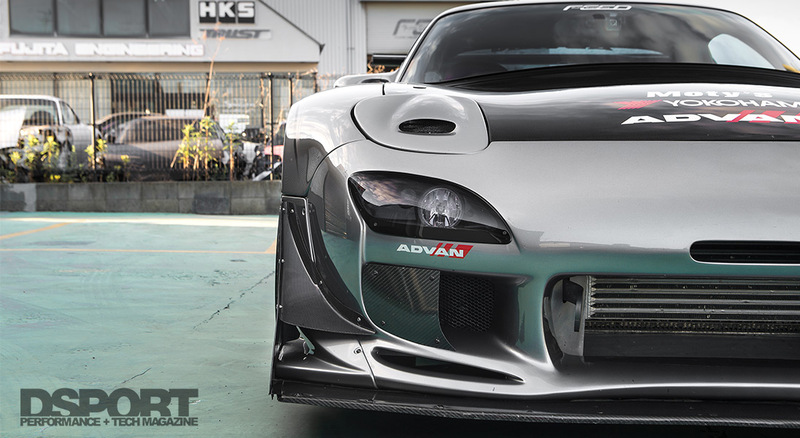 The FEED team would build the fastest tuning car possible out of this FD. Given that the company designs and builds parts for customers, a large portion of the build would be made from in-house developed products. The build started with powering up the lightweight 13B-REW engine. This comes with the help of a Garrett GTW3476 turbocharger upgrade with a FEED intercooler to keep intake air temperatures down. An HKS EVC boost controller and HKS wastegate manage the pressure, while HKS leading and trailing spark plugs fire off the combustion with the help of four 1,000cc injectors. An HKS F-CON V Pro engine management system enabled the FEED team to tune the engine up to deliver 631 horsepower at approximately 7,000 RPM and 491 lb-ft of torque at approximately 6,100 RPM. A FEED-rebuilt and strengthened transmission sits behind the engine, mated to it through an Exedy Competition R clutch. The engine’s power is then sent to the rear wheels by way of FEED’s own Maou Spec differential. As usual with most rotary engines, the build is happiest above 5,000 RPM when on track. 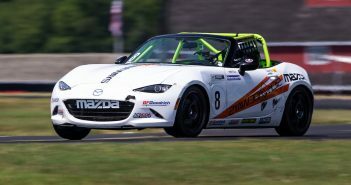 However, Yoshiharu and the FEED team ensured that the car’s power and torque figures made it easily drivable on the street on the way to and from events, shows, and race tracks. 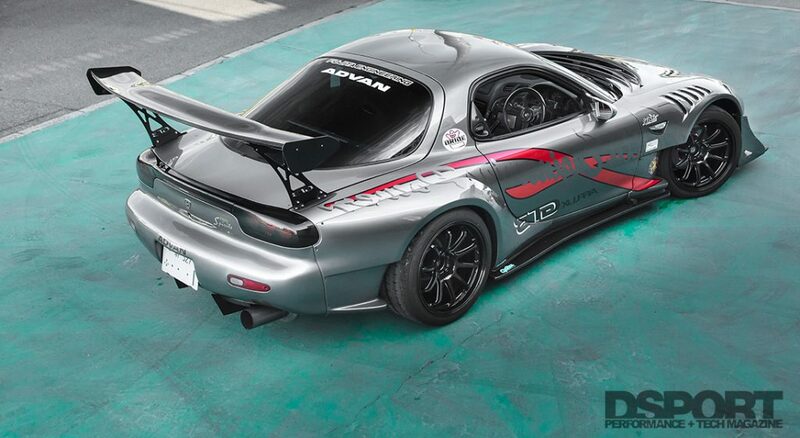 The FD generation RX-7 is notable for not only its engine but also for its handling capabilities. Spanning 169 inches in length, 69 inches in width, and only 48 inches in height allow the car to hug the ground when powering through tight twists and corners. This is only emphasized with a low curb weight of approximately 2,800 pounds. Yoshiharu and the FEED team set out to improve the car’s handling characteristics further with uprated brakes and suspension. Suspension Plus 20 kg/cm2 front springs and 22 kg/cm2 rear springs wrap around a set of four FEED dampers to keep the car planted to the ground. This configuration enables the car to sit lower and with an improved center of gravity. At the same time, it reduces the body roll and thus improves weight transfer characteristics for the corners. There is still room to gain with even stiffer suspension, but Yoshiharu is set on keeping the FD streetable for the time being. A set of Advan RS-DF Progressive wheels, sized 18×12 inches, sit at all four corners to help the car stick with an impressive appearance. Inside the wheels, FEED steel-braided brake lines improve pedal feel from the Seido-Ya brake pads on Endless rotors. In preparation for occasional track days and spirited driving, the FD took to some functional interior and exterior upgrades. Bride seats and Takata harnesses sit in the cabin to keep occupants safe and to give the driver an improved feel for the car’s responses. 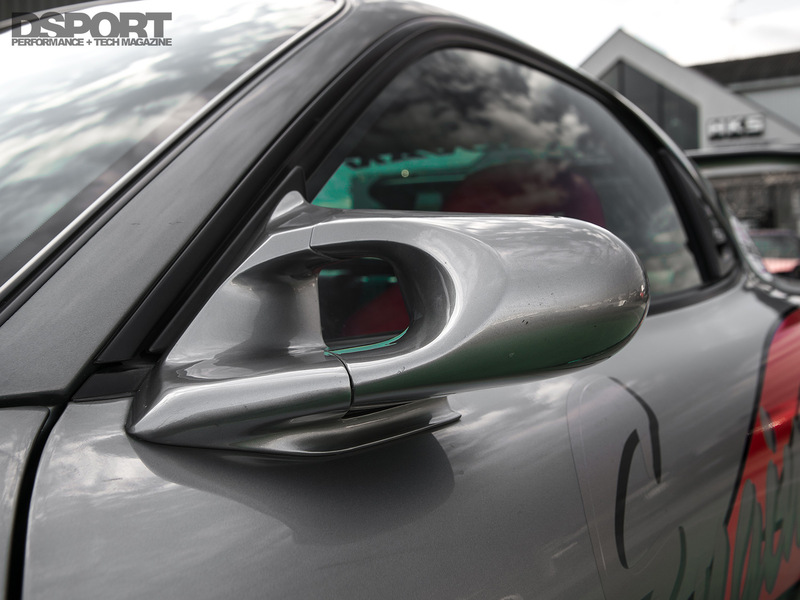 Outside the car, AFFLUX hardware provides extra downforce to complement the mechanical grip. An AFFLUX Version 2 Type R bumper improves looks with new curves that complement the car, as well as redesigned light housings. An AFFLUX Carbon Aero Bonnet lightens up the front end and reduces air pressure in the engine bay, aiding in both cooling and aerodynamics. At the rear end, an AFFLUX diffuser and GT3 wing balance the front and rear aero grip for high speed turns. AFFLUX aero components are not only functional, but they also accentuate and benefit the FD’s existing curves and body lines for a beautiful looking final product. 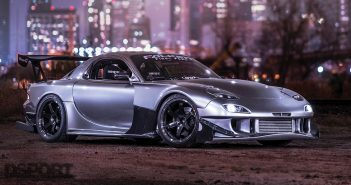 The Fujita Engineering FEED Racing Program’s FD3S has come a long way since acquiring the car ten years ago, but it is likely never to be called finished. Fujita Yoshiharu and his team are still hard at work on the car, continuing in the same way that they started by using the car as a testing and development vehicle. Through trial and error, the team constantly experiments with newly engineered parts and car setups, aiming to make it one of the most capable tuning cars you’ll find on the street. As the team makes new discoveries, the results find their way into the customer’s hands and on their builds at home. It’s exciting to witness teams and engineers not only continuing to develop the FD platform 15 years after its demise, but to also share their knowledge and expertise with enthusiasts everywhere.